There haven’t been this many rock stars together in one place since Woodstock or Live Aid. Look, there’s Bruce Springsteen! Did you see Jon Bon Jovi? Slash, Freddie Mercury, Prince, the Beach Boys and Kiss were at the party, too. So was Elvis. 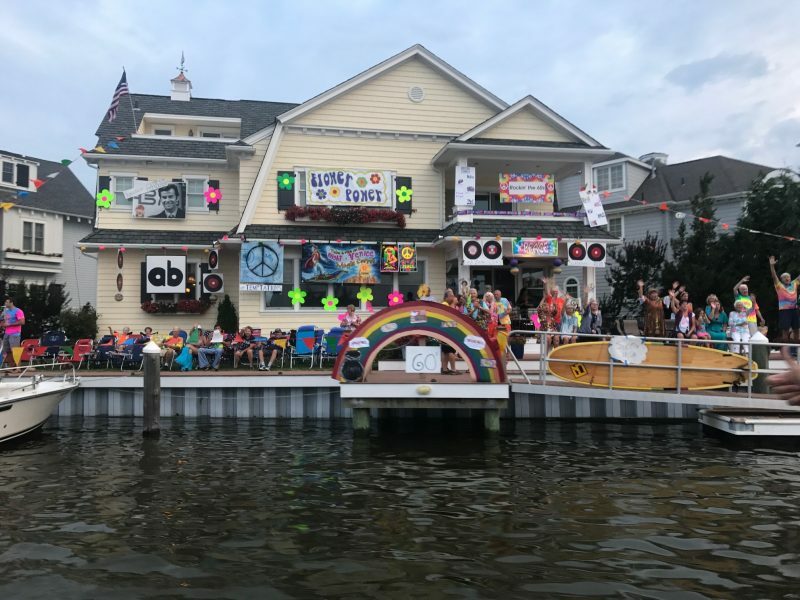 This glittering collection of the pantheon of the rock-and-roll world cruised into town on a flotilla of colorfully decorated boats that brought scores of cheering spectators to their feet Saturday evening. Truth be told, though, all those “stars” were actually impersonators who gave the bayfront crowds a chuckle while performing in their rock-themed boats during the 63th annual Night in Venice boat parade. An estimated 50,000 people poured into town for Ocean City’s biggest summer spectacle. This year’s event featured a “Rockin’ Through the Decades” theme, which drew a sampling of musical tastes from the Roaring Twenties to the disco era to the rock superstars of today. A blown-up image of Springsteen, New Jersey’s favorite son, adorned one boat as “Born to Run” blared over the loudspeaker. 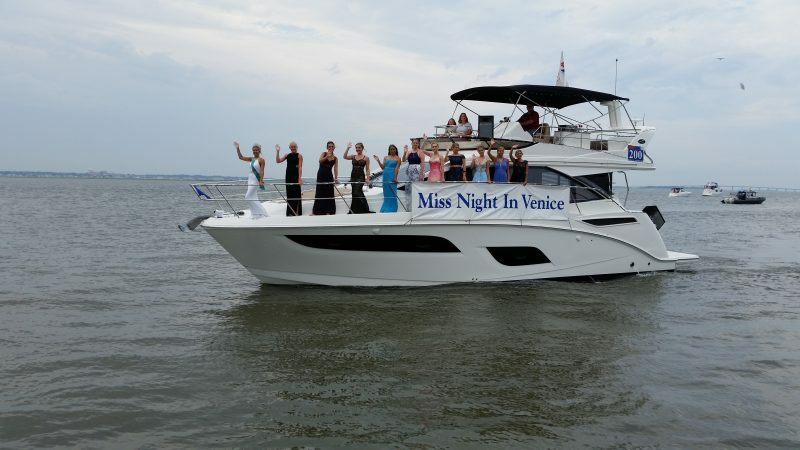 Night in Venice beauty queens wave to the crowds lining the bayfront. Whoever proclaimed that “disco is dead” years ago might have had a change of heart after seeing all of the groovy boats from the days of the Bee Gees, Donna Summer and the Village People. One boat was cleverly transformed into a floating Studio 54, complete with dancers decked out in polyester shirts, bellbottom pants and platform shoes swooning to “Disco Inferno” by The Trammps. 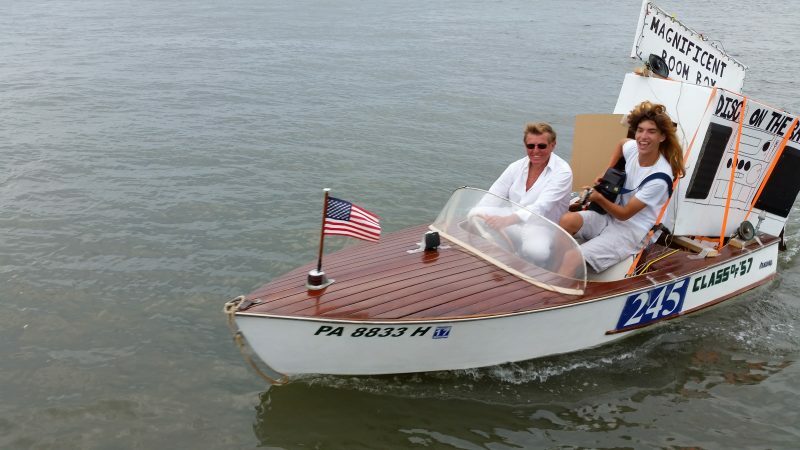 The smallest boat in the parade, a tiny pleasure craft carrying a two-man crew, was comically decorated as a “Magnificent Boom Box” that paid tribute to the Brothers Gibb of Bee Gees fame. A tiny boat transformed into a “Magnificent Boom Box” pays tribute to the Bee Gees of disco fame. The boat parade is complemented by scores of elaborately decorated bayfront homes, many of them shimmering in lights. Homeowners fiercely compete for prizes for the best decorations. Sue Hornyak, for instance, of 265 North Point Road, was looking to extend her winning streak to a fifth straight year. Her house was transformed into a virtual “Big Top” in a tribute to the Ringling Bros. and Barnum & Bailey Circus. Hornyak and her family members dressed up as circus characters, such as clowns, tightrope walkers and a ring master played by her son, George. “We all put a lot of effort into it to make it a fun night,” Hornyak said. 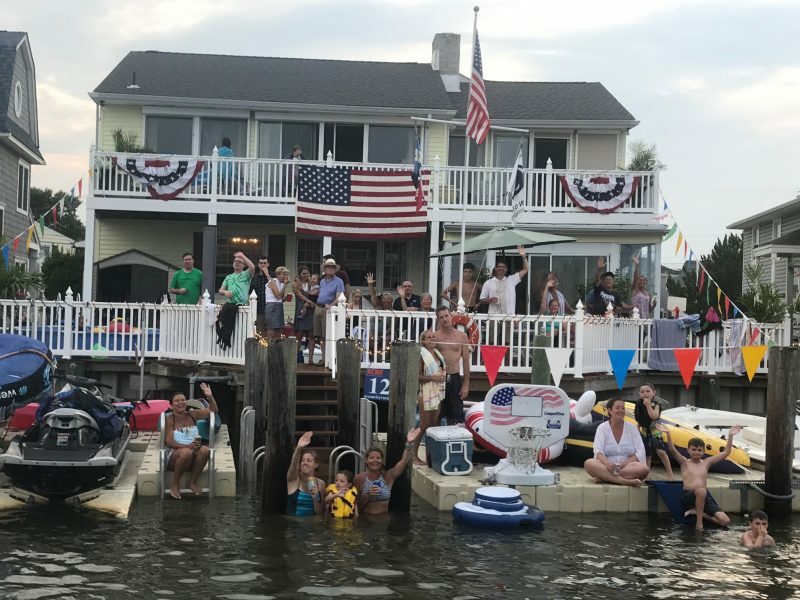 Suzy Dolaway, of 231 North Point Road, had plans for a “Disco on the Dock’’ party that included a silver dance ball hanging over the center deck, lava lamps on the tables and live music. “You can say, ‘Groovy,’” Dolaway said, laughing, about the lava lamps. Bayfront property owners get into the swing of things by dressing up their homes with elaborate decorations. One public vantage point for catching all of the action was the Ocean City Bayside Center at 520 Bay Ave. Hundreds of people sat in the bleachers set up at the Bayside Center, applauding and cheering as each boat passed by only a stone’s throw away. Stacey Green and her 5-year-old daughter, Iliana, were attending their first Night in Venice celebration. 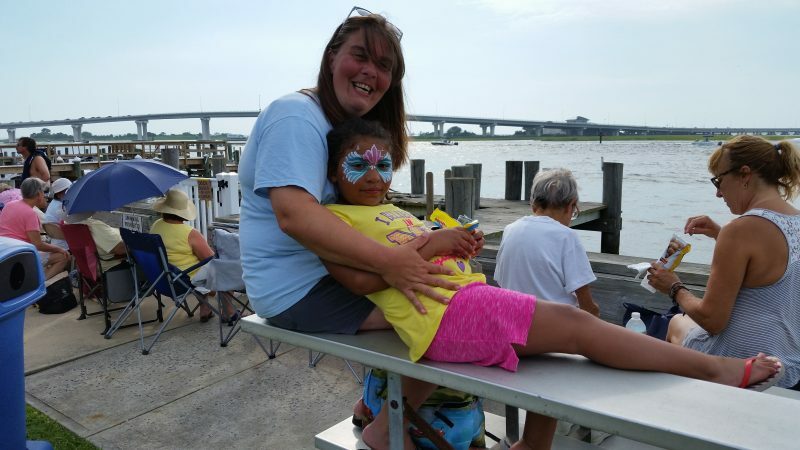 Iliana, who had her face painted like a mermaid, was patiently waiting for the boats while munching on a hotdog and some candy. “I want to see the boats. Really pretty ones,” Iliana said softly as her mother smiled. Green and her daughter, who live in Kunkletown, Pa., are vacationing for the week at a campground in Marmora. “We were looking for something to do, something that was family-friendly. We heard it was really fun, so we came to check it out ourselves,” Green said of Night in Venice. Stacey Green and her 5-year-old daughter, Iliana, on vacation from their home in Kunkletown, Pa., enjoy their first Night in Venice together. Barindra and Kiran Patel, a married couple from Nutley, Essex County, drove down from their home Saturday to attend their first Night in Venice. They were on the road for more than two hours during the approximately 120-mile drive to Ocean City. They were planning to head back home right after the festivities were over Saturday night. “I’m enjoying the day. I’m enjoying the people. 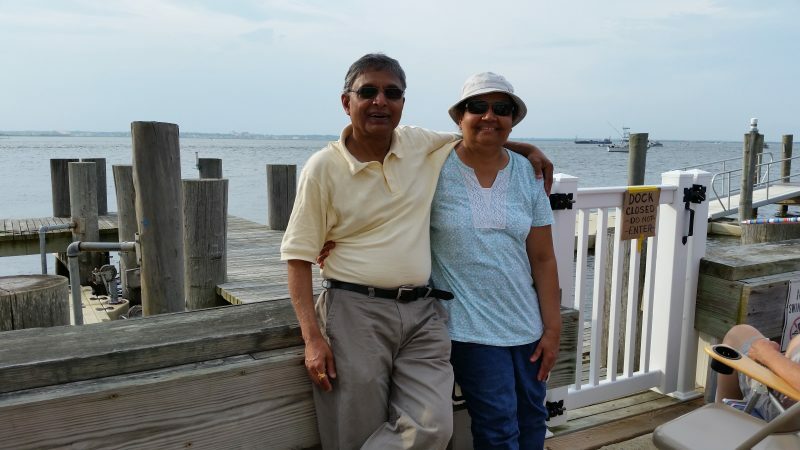 What else could you want?” Barindra Patel said while soaking up the picturesque bayfront scenery. His wife, Kiran, told him Friday night that she wanted to see Night in Venice. He agreed. The Patels are now thinking about making Night in Venice an annual tradition. “It’s something different. Something unique,” Barindra Patel said. Barindra and Kiran Patel, a married couple from Nutley, Essex County, made a 120-mile day trip to see Night in Venice. Ocean City touts Night in Venice as the oldest boat parade and bayfront celebration at the Jersey Shore. This was the 63rd consecutive year for the event. Ocean City Beach Patrol Capt. Jack Jernee was instrumental in planning Night in Venice in 1954 as part of the 75th anniversary celebration of the city’s incorporation. The first Night in Venice was actually in 1907, with cottages and bungalows along the bay illuminated with lights and torches, according to Ocean City historian Fred Miller. Two lifeguards led the first boat parade in a rescue boat. The celebration ended with a fireworks display and bonfire on one of the islands in the bay. The event lasted for a few years, then was revived in the 1920s before the modern run of 63 consecutive years began. Jernee had remembered the event from the 1920s when he brought it back, according to city spokesman Doug Bergen, who also provided some of the history of the Night in Venice. Video by Ryan Givens with special thanks to Kirk & Suzy Dolaway. There was plenty of partying and revelry at many bayfront homes as the boats passed by.